It’s that time of the year again when work slows down, colleagues (especially bosses) get into the festive mood and I have the time to muse about random thoughts. So here’s some thoughts on last meals and what I think makes food great. I just realised the other day that I have been unwittingly pre-programmed by the marketing and PR surrounding the food industry. When asked what would be my last meal, almost instinctively, I sprouted an impressive list of items which were worth (almost!) their weight in gold. Items such as kobe beef, black truffles, foie gras, korobuta pork and champagne seemed to flow effortlessly. I seem to have bought into the general societal association of costs and desirability. Generally, the theory goes that the rarer and more expensive, the more it should be valued. What is available to the few should surely be the best. And that the masses should long for and aspire towards these things. But when I had the time to sit back and think more deeply about this issue, especially in relation to food, I also saw that my instincts had been corrupted and my answers flawed. What makes food great? There would be as many answers as there would be unique fingerprints in the world. But, surely, the amount it costs can’t be it. I thought back to my most extravagant dining experience where I had the luxury of dining in a Michelin 3 starred restaurant ‘Daniel’s’. The dinner while good, did cost me an obscene amount, given that I am no high flying financier, celebrity or politician. And notice that I said good, not unforgettable, not unbelievable and certainly not last meal worthy. To top it off, I was initially pretty boastful about spending a small fortune in arguably New York’s most famous restaurant. I totally subscribed to societal norms and thinking about, not proud of it. So I mediated on my last meal would be, sat in a quiet corner (the office works well these few days) and let my instinct guide me. The thoughts that passed through my mind were aplenty but seemed centred on familiar favourites that I grew up with. Primarily, hawker food. Specifically, Hill Street Char Keow Teow. From there, I tried to figure out what made this my choice. Ingredients? Simple and few. Cost? 4 dollars for a big plate. Setting and Ambience? Crowded, noisy and sweaty. Taste? Great but so do many other dishes. After awhile, I got my ‘Aha!’ moment. What makes food great? I believe that memories do. The greatest food evokes memories and longings of the precious past. For me, it’s the representation of a time where things were simpler and more honest. It’s the recollection of friends, many of whom I have lost contact with. It’s a representation of a part of me. That’s what makes food great. I think this is why my own cooking inclinations have been so far removed from the food that I love. Even if I could replicate the taste of these hawker masters (which is near impossible), that would only be a part of the equation. So there you go. My last meal request? Hill Street Char Keow Teow. 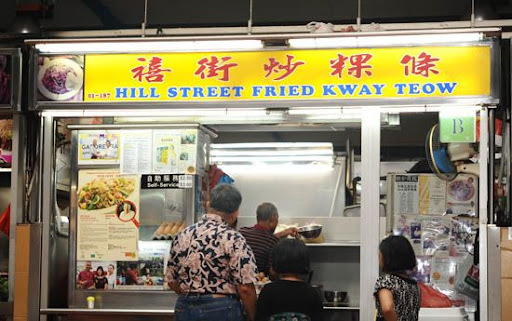 This entry was posted in MUSINGS and tagged char kuay teow, hill street, last meal, musings by Whisky Uncle. Bookmark the permalink.